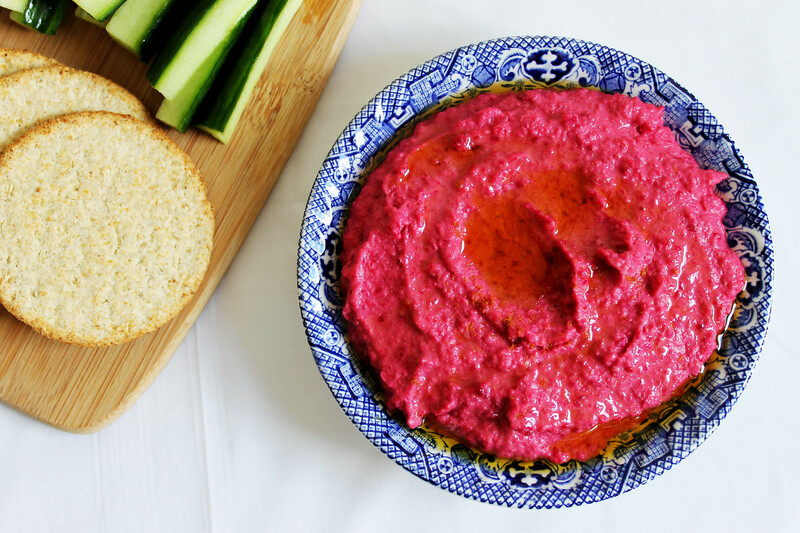 Let us just stop for a moment and admire the colour of this roasted beetroot hummus. Beetroots are such a pain to wash off your hands but so so pretty in food! Beetroot is one of those foods that I’ve always ‘hated’ – that is until I grew up and stopped automatically turning my nose up at things that were outside of the norm for me. In the case of beetroot the norm was that awful pickled, acidic, vinegar laden stuff that comes sliced in a jar. Now I’ve discovered the beauty of fresh beetroot – raw, steamed or roasted I can’t fathom why for years the only way you could buy this delicious veg was laden with vinegar, completely overpowering the earthy yet incredibly sweet taste of this root vegetable. The revival of beetroot is likely due to our increased awareness of the health benefits of certain vegetables. Beetroot is one of the kings here, laden with iron and folic acid and as suggested by its deep dark colour, heaving with anti oxidants. 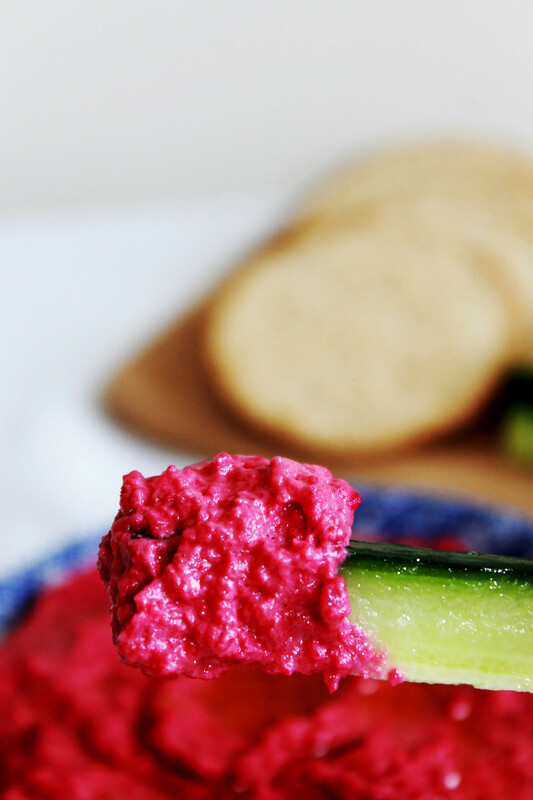 I’ve been eating a lot of hummus lately, the beauty of which is that you can throw almost anything into the mix and along with some veggie sticks or some oat cakes you’ve got a hearty healthy meal or snack. 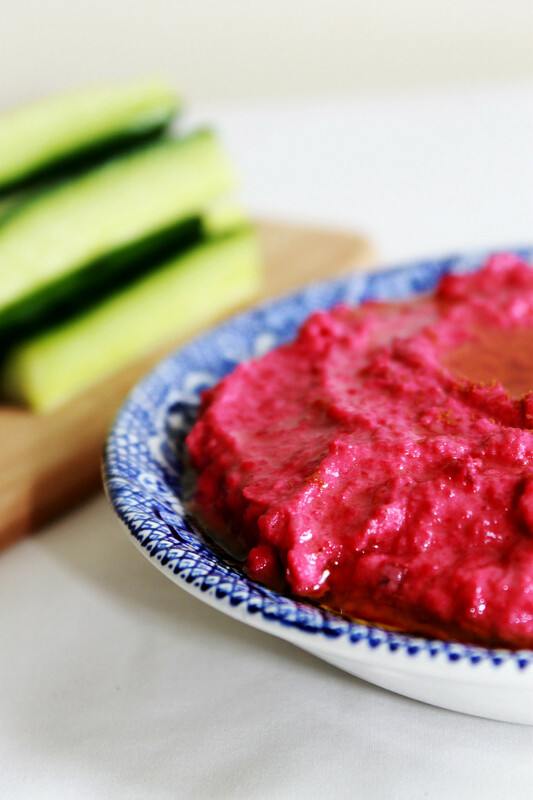 This roasted beetroot hummus is deliciously sweet and creamy. This recipe is largely inspired by the one over at www.nigella.com. Preheat your oven to 180C (fan). Wash your beetroots but leave the skin on and place in a roasting tray. Place into the oven for 40 minutes (depending on the size) or until you can pierce them all the way through with a knife. Remove from the oven and leave to cool while you get the rest of your ingredients ready. Peel your garlic, juice your lemon, drain and rinse your chickpeas. When the beetroots have cooled enough to handle, peel the skin away. Place them along with all of the other ingredients into a food processor and whizz together until you have a purple creamy mixture. Serve in a large dish with crudités and crackers or oat cakes. Drizzle with a little more olive oil and dust with ground cumin.